Since the spin out from Juniper in 2014, Pulse Secure has developed far beyond siloed remote access solutions and into a more comprehensive, flexible, and interoperable secure access portfolio solution for enterprises. With the expansion of the Pulse Secure product line, the Pulse Secure Access Suite, secure access is delivered across a range of heterogeneous endpoint, mobile, network, cloud and security environments. 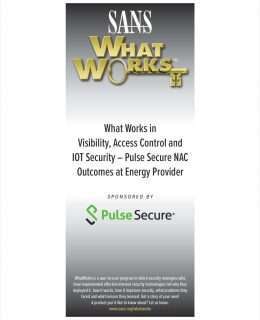 This report features a discussion between John Pescatore, Director SANS Director Emerging Security, and Dave Cullen, Manager of Information Technology at Entegrus, a Canadian power company with facilities and users spread across multiple regions, with a wide mix of IT and OT devices connecting to many different networks. They discuss how Entegrus integrated Pulse Secure Network Access Control into their network fabric to strength their security posture, giving them visibility into the assets in use, as well as to enforce access controls while minimizing any business user disruption.